Preheat oven at 150 celcius. Sprinkle half the fingsalt onto a baking tray, add in all the black pepper, bayleave, star anise and half the fresh thyme. 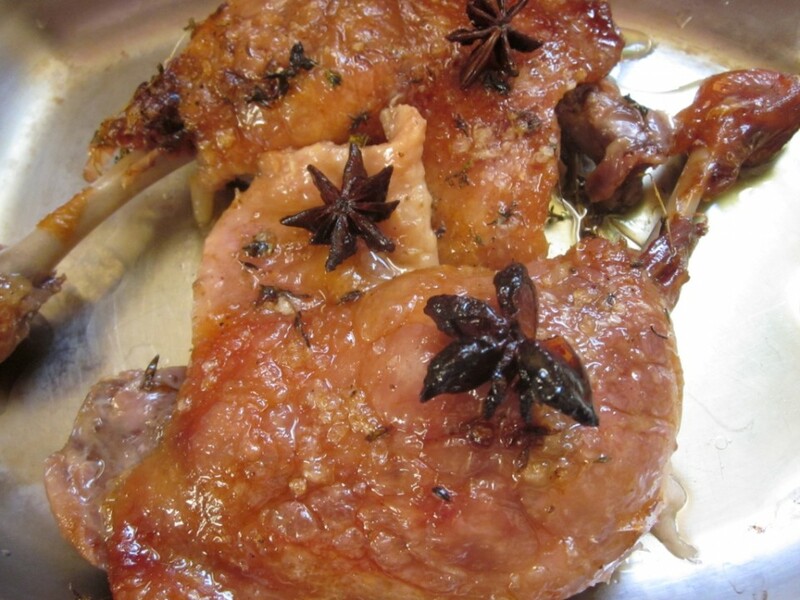 Place the 2 pieces of duck leg on top of the spices and herbs then sprinkle the rest of the flingsalt and fresh thyme on top of the duck legs. Pour duck fat on top of the legs (do not worry if the fat is in chunk, it will melt to cover the legs once it is in the oven). Bake for about 45 minutes then lower the heat to 100 celcius to slow cook for about 2 1/2 hours. (You can also set oven to 80 celcius if you want to bake it overnight in the oven). Once confit is done, pour out the top layer of duck fat leaving a layer of duck stock. (You can cool down the duck fat and store it in the fridge, you can reuse the fat again for cooking or baking for at least a few times). Soak glass noodle with warm water for about 20 minutes, strain dry. Heat frying pan, add in 2 tbsp of duck fat. Fry galic until slightly brown before adding in all the vegetables. Stir fry for 1 minutes then add in the glass noodle with 2 to 3 tbsp of the duck stock (be careful not to add too much stock because the stock is salty). Stir fry for another 1 1/2 minutes. 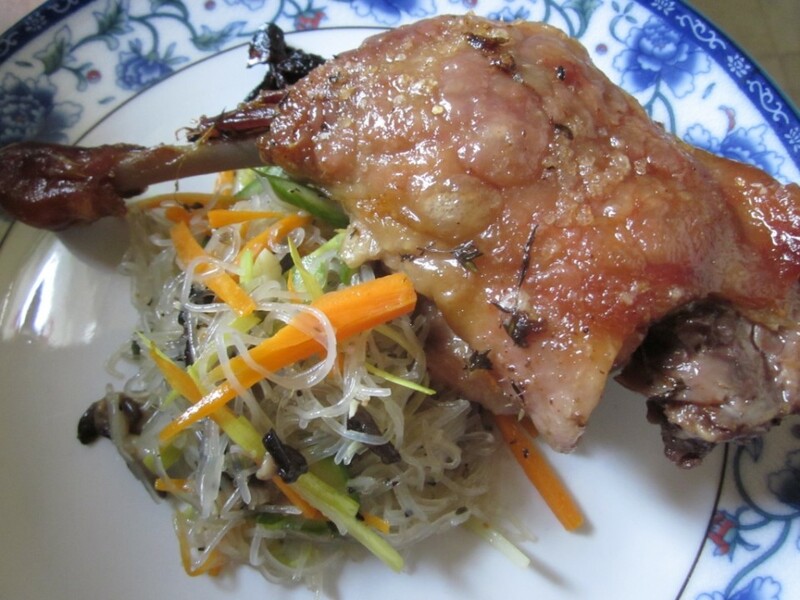 Serve glass noodle with duck confit. You can also garnish with a little coriander and juliened red chili if you like.